In addition to waterfront activities, we have lovely wooded grounds with mature pine and shade trees and a small playground for your children. There are many scenic roads to explore and pleasant trails for hiking. Our property adjoins the Paul Bunyan bike trail, which provides 100 miles of sceneic views. 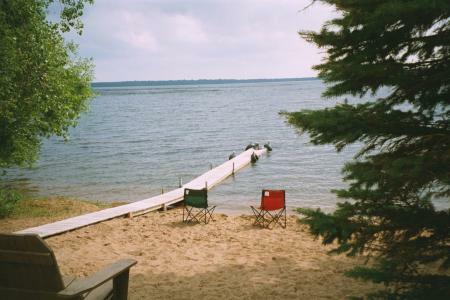 The Brainerd Lakes Area offers a large number of recreational activities. There are seven fine golf courses and many tennis courts nearby. You can enjoy auto racing at B.I.R or turtle racing in Nisswa. If you prefer more conventional entertainment, you can spend your time rambling the back roads or exploring the fine gift shops and restaurants of the area. Craft fairs and other events are held frequently throughout the summer. FISHING is one of our favorite pastimes. Lake Hubert provides anglers excellent fishing oportunities for large and small mouth bass, crappies, northerns, and sunfish. 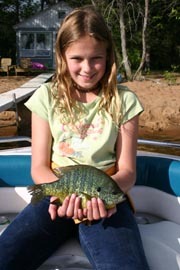 A large percentage of our customers come primarily for fishing. 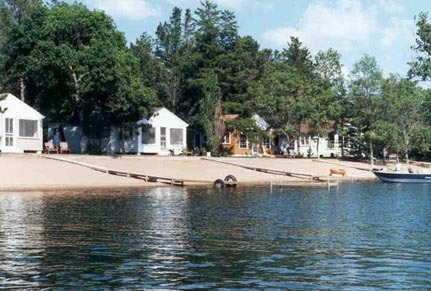 Most of our cottages come with a 14 foot aluminum fishing boat and all have a private dock. We also have outboard motor rental, a fish cleaning house, and a freezer. Bait, licenses, gas, and groceries are available nearby. The cottages are clean, comfortable, and equipped for housekeeping. Sheets, pillows, and blankets are furnished. We do not provide towels or paper items. Each cottage has lawn chairs and some have picnic tables. Cottages #4 and #5 have enclosed screen porches, but all open up nicely to allow the warm summer breezes to circulate. 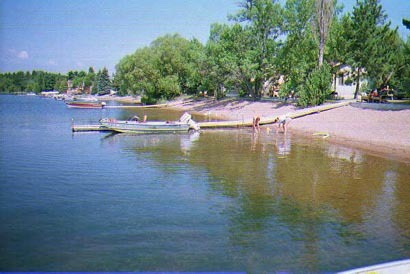 Beachland is located on Lake Hubert, which has been a favorite of tourists since the early 1900's. Lake Hubert is still regarded as one of the cleanest and most beautiful lakes in the area. You can go to sleep at night listening to the waves lapping on the shore. When you wake, you are only a few steps away from a day of fishing or swimming. 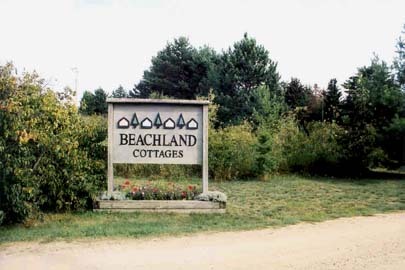 Beachland is a traditional family resort with a pleasant relaxing atmosphere. We have ten modern cottages, nine of which are located on a beautiful sandy beach just fifty feet from the water.